Accompanying the large set of books are CDs with guitar rhythm accompaniment included. Build your repertoire, right and left hand skills and have fun playing at jam sessions with your friends. 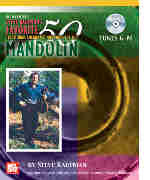 This 4 volume set written specifically for the mandolin also has a sister series for guitar.